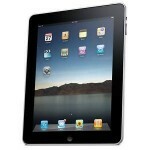 Starting on Thursday, October 28 both AT&T and Verizon will start selling iPads in retail stores. Verizon Wireless will offer three different bundles, which all feature an iPad Wi-Fi model along with a Verizon MiFi 2200 Intelligent Mobile Hotspot. Those models will run $629.99 for iPad Wi-Fi 16GB + MiFi, $729.99 for iPad Wi-Fi 32GB + MiFi and $829.99 for iPad Wi-Fi 64GB + MiFi. The MiFi 2200 is a small router that creates a personal Wi-Fi cloud which can share Internet access from the Verizon Wireless 3G Mobile Broadband network and allow access of up to five Wi-Fi-enabled devices. The Verizon monthly plan will run $20 a month for 1GB data transfer. You’ll also be able to buy the iPads as stand-alone devices without the bundle. AT&T will sell all three of the iPad Wi-Fi + 3G models in-store and offer 3G pre-paid data plans without a term contract. AT&T stores will offer the iPad for the following prices: $629 for 16GB; $729 for 32GB; and $829 for 64GB. Domestic data plans for iPad are $14.99 per month for 250MB and $25 per month for 2GB with no term contract.